Steve talks to CNBC's Mad Money. 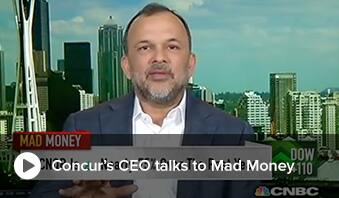 Jim Cramer says Concur’s cloud-based software is a serious money saver for its 20,000 clients—and that Concur is revolutionizing the way businesses operate, using automated expense management and travel booking processes. Our growing ecosystem of partners also provides an increasingly better value to customers as we move toward delivering a platform experience. Steve tells Jim about the range of small and enterprise business customers signing on with Concur, and explains how our cloud-based offerings helps these companies solve their travel and expense challenges, therefore allowing them to focus on what matters most. Steve talks to Jim about the enormous value in having a rich ecosystem of partners and a platform approach: in the end, everyone benefits—the suppliers, the company and the employer. He then offers an example of how a platform can deliver the ultimate customer experience, anticipating traveler needs and quickly adapting to change. Interested in who Concur is and what we do?